Alitalia has an offer for new account signups through March 30th. You also receive 2000 miles for having your first account activity within three months of signup. I’ve flagged the strategic value of the Alitalia program in the past for some sweet spots in their award chart and the opportunity (uncommon among many non-North American programs) to use double miles for any seat. They are of course a US American Express Membership Rewards transfer partner. 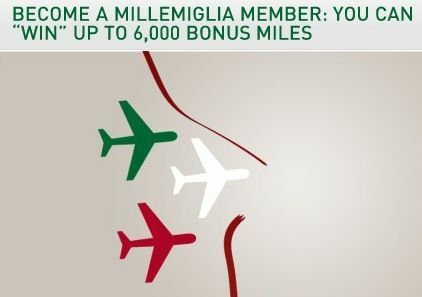 Any way to earn a few quick Alitalia miles to score the additional sign-up bonus, other than a Membership Rewards transfer? I love that the application ask if I’m a member of the Continental or Northwest mileage programs. Oh, and the confirmation page tells me I’ll get a 1,000 mile bonus if I register by 31/12/06. Guess I shouldn’t complain so much about AC’s IT issues. I’m flying alitalia tomorrow…. Too bad I already had an account with them. But my 2 friends going with me can benefit! Does a MR xfer count as an activity? Key point to note with this program is that when using miles for an award ticket; 25% of the must be earned miles with Alitalia or MilleMiglia Partners, Purchased or transferred miles can be used for a maximum of 75%. What about transferring 1 SPG point to get the “partner” bonus? Will it count? I’m registered but now to log-in, it asks for a code plus my pin. I have the pin but what is th code? My registered email address doesn’t seem to work. Never mind-Code is the Account Number (of course).